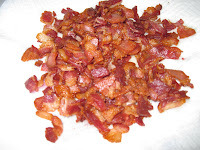 What has bacon, eggs, cheese and is something you eat for dinner? 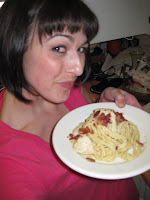 It's not fritatta....it's CARBONARA! 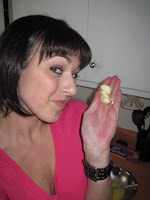 My pal Jen has a blog called Momma J Cooks! 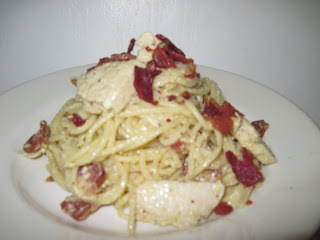 (here is the link to it: http://mommajcooks.wordpress.com/) and last Saturday she made some pasta carbonara. She inspired tonight's meal...and guess what? It's S-A-T-U-R-D-A-Y Night! ...are you singing the song yet? haha! 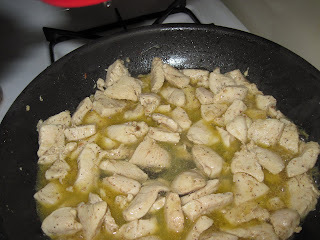 This pasta doesn't really need chicken, but my boys like chicken and I had some on hand. So I figured, why not? 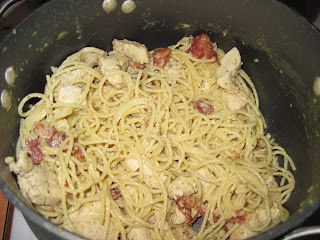 Chicken, bacon, cheese, pasta...yeah, sounds good. 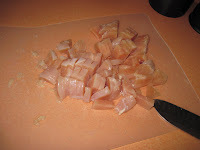 I whipped up a quick marinade for a couple of sliced up chicken breasts. 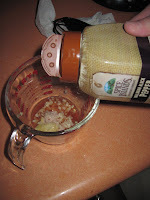 Combine all ingredients and whisk together. 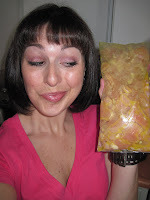 Pour over the sliced up chicken in a ziplock baggie and stick it in the fridge for a few hours. I usually do this around lunchtime. If you don't have that much time...you can just let it marinate for 1/2 hour. 1 lb of spaghetti - I'm using the Ronzoni Smart Taste. It's really good. High fiber and it tastes like "normal" pasta. 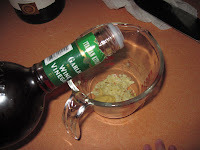 2/3 c. grated parmesan or romano cheese - I'm using Grana Padano because it's what I have on hand. 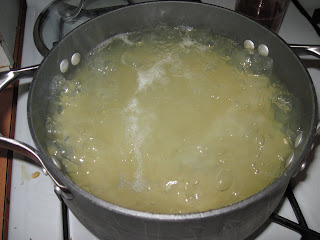 Get a large pot of water on to boil for the spaghetti. 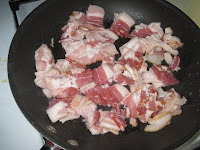 Take a skillet and add the diced/chopped bacon. Cook until crisp. 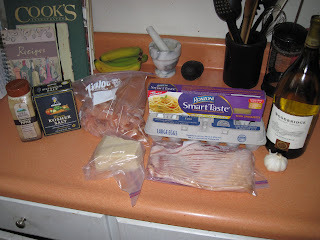 Remove crispy bacon from pan and drain on paper towels. 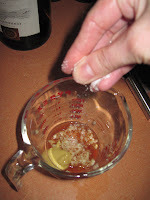 Pour off all excess grease and set aside. The water should be boiling by now, so get the spaghetti into the hot tub! 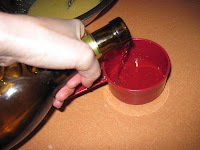 Use the same skillet you cooked the bacon in & get it hot again, add the chicken & all of the marinade and sautee until just about cooked through - add the wine and let it cook a minute more until it's thoroughly cooked and the wine reduces a bit. 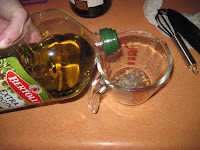 There will be liquid in it....this is going to add to the sauce and flavor of the pasta. The pasta will absorb it up! 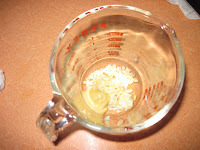 As the pasta is cooking, beat your eggs, grate the cheese and mince the garlic. 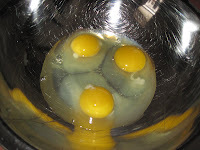 Combine & whisk them together. 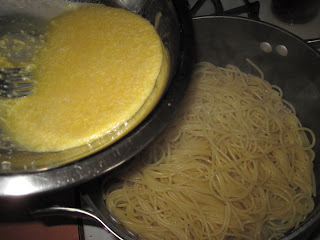 When the pasta is cooked al dente, drain it well and put it back in the hot pan. 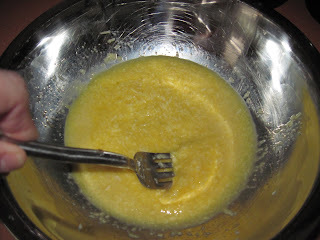 Toss with the egg/cheese/garlic mixture. Make sure you toss it quickly so you don't have scrambled eggs in your noodles! 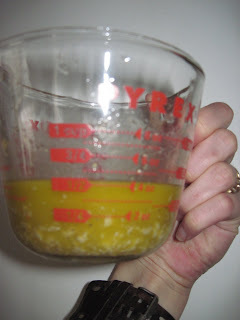 You may want to temper the eggs with a dash of the hot liquid from the chicken in case you are worried about it. 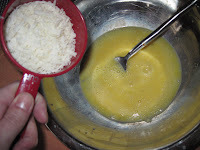 The hot pasta will cook the eggs and melt the cheese making a silky delicious sauce for the pasta. Once the egg mixture is incorporated go ahead and add in the cooked chicken/wine/marinade and crispy bacon...season with salt & pepper. Dinner is served! This makes A LOT of food. We will have leftovers for days. My hubby & I both went back for seconds and my toddler ate his whole plate. His exact words were "mama, I loooove bacon & noodles!" Me too, son. Me too. Looks deee-licious! Thanks for the shout-out!! 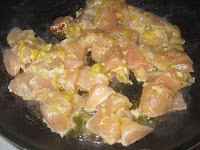 Love how you adapted it with the chicken & marinade turned sauce!